Zalnezhad, Kaveh, Esteghamati, Mahnaz, Hoseini, Seyed Fazlollah. (1395). Examining the Role of Renovation in Reducing Crime and Increasing the Safety of Urban Decline Areas, Case Study: Tehran’s 5th District. معماری و شهرسازی آرمان شهر, 9(16), 181-192. Kaveh Zalnezhad; Mahnaz Esteghamati; Seyed Fazlollah Hoseini. "Examining the Role of Renovation in Reducing Crime and Increasing the Safety of Urban Decline Areas, Case Study: Tehran’s 5th District". معماری و شهرسازی آرمان شهر, 9, 16, 1395, 181-192. Zalnezhad, Kaveh, Esteghamati, Mahnaz, Hoseini, Seyed Fazlollah. (1395). 'Examining the Role of Renovation in Reducing Crime and Increasing the Safety of Urban Decline Areas, Case Study: Tehran’s 5th District', معماری و شهرسازی آرمان شهر, 9(16), pp. 181-192. Zalnezhad, Kaveh, Esteghamati, Mahnaz, Hoseini, Seyed Fazlollah. Examining the Role of Renovation in Reducing Crime and Increasing the Safety of Urban Decline Areas, Case Study: Tehran’s 5th District. معماری و شهرسازی آرمان شهر, 1395; 9(16): 181-192. 1M.A. in Geography and Urban Planning, Islamic Azad University, Branch of Rasht & Young Researchers And Elite Club, Nour Branch, Nour, Iran. 2M.A. in Geography and Urban Planning, Islamic Azad University, Rasht Branch, Rasht, Iran. This article has been done having the objective of proposed principles regarding the role of urban decline areas and being impressionable in reducing crime. It was an investigation on urban crimes in decline areas, and finally the implementation of an approach that will lead to the creation of a healthy city. The result of this article is application of the urbanization principles aiming at having a healthy areas in designing cities’ which not only improves urban environment security but also leave good memories in mental images of citizens. 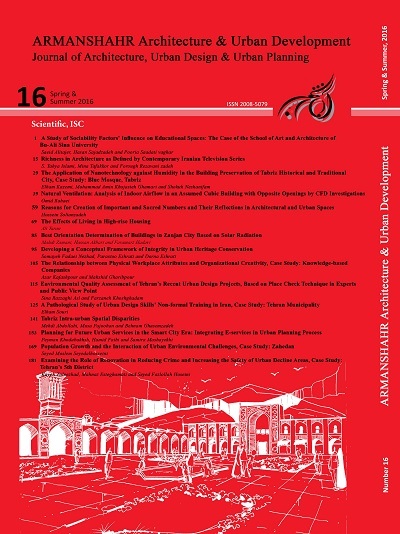 This article analyzes decline areas of Tehran’s 5th district through renovation of urban decline areas and creating a safe urban environments; this happens through examining the case under study with a holistic approach. For this purpose, the desirability of decline areas and finally the role of decline area of Tehran’s 5th district has been examined in creation of challenges in Tehran urban management according to the conducted studies of the target area, the relationship between living in outskirts and crime rates, the link among improvement patterns, reconstruction of decline areas and citizen participation and the relationship between the organizing facade, glazing and skyline based on a detailed plan. Some results of this paper are as follows: Sustainable renovation is not possible without understanding and concentration on the social, cultural and economic structure. Furthermore, without attracting the real participation of owners, having access to desired improvement will not be fulfilled. Followed by the full attention of city’s custodians and police which reduces the vulnerability of these areas. The current situation of decline areas in the case under study is in an unsuitable condition and the uncontrolled growth of ugly pattern which has brought dissatisfaction for citizens. Research method was descriptive-analytic data collection and the research has been done through questionnaires, interview, observation, and library study. The analysis of the obtained data has been done by the utilization of SPSS software and LISREL, and the results of this examination show the important role of decline area’s renovation in increasing security and reducing crime. Ahmad Abadi, Z., Salehi Heikouie, M., Ahmad Abadi, A. (1999). The Relationship between Crime and Location, Social Welfare Periodical, 7(27). Bagheri, M., Moltafet, H. (2010). Investigating the Influential Family Factors on Commission of Crime, Disciplinary Knowledge Periodical, 11(4). Bayat Rostami, R., Kalantari, M., Hasani, S. (2010). Empowering Passages and Urban Neighborhoods for Crime Prevention through Environmental Design (CPTED), Second Conference of Planning and Urban Management, Ferdowsi University of Mashhad. Brown, L. (2000). Geography of Crime, University of Wollongong. School of Geosciences, from the World Wide. Cozens P.M. (2002). Viewpoints Sustainable Urban Development and Crime Prevention through Environmental Design Forth British City. Towards an Effective Urban Environmentalism for the21st Century, Cities, 19(2), 129–137. Cozens, P. M., Hillier, D., Thorn, M. (2002). Designing out Crime, Case study: Property Management in Western Australia. Crowe, T. (2000). Crime Prevention through Environmental Design: Applications of ArchitecturalDesign and Space Management Concept, Butterworth, Heinemann, Oxford. Detailed Plan of Tabriz, 1980. Habibi, M. (2001). Tourism Walking Route, HONARHA- YE-ZIBA, 9, 43-51. Hanachi, S., Mojgani, P. (2006). The Necessity of Using Strategies of Planning and Designing Public Urban Spaces in Reducing Crime, Shams Monthly Magazine,August and September. Hinkle, C. J. (2009). Making Sense of Broken Windows:the Relationship between Perception of Disorder, Fear of Crime, Collective Efficacy and Perception of Crime, Ph.D. Dissertations, University of Maryland. Environmental Design, Case Study: The City of Qom, Crime Prevention Studies Periodical, 8(29). Kalantari, M. et al. (2011). Urban Structural Areas’Immunization against Crime using Crime Prevention Strategies through Environmental Design, Disciplinary Knowledge Periodical, 12(3). of Justice’s Legal and Judicial Magazine, 33,137-164. Criminology) (Rozitadarouie , Ed. ), University of Tehran, Faculty of Political Science. Urbanization, Political and Economic Information, Issue 15th. Pradel, J. (2002). History of Criminal Idea (A. H. Najafi Abrandabadi, trans.). Tehran: Samt Publications. Rahmat, M. R. (2009). Crime Prevention through Architecture and Urbanization, New Strategies for CrimePrevention, Tehran: Mizan Publications. Schneider, R., Kitchen, T. (2008). Urban Planning for Crime Prevention (F. Sojoudi, trans. ), Tehran: Mizan Publications. Shakuie, H. (1990). Social Geography of Cities(Social Ecology of City). Second Edition, Tehran: Jahad Daneshgahi Publications. Wilson. James Q. & Kelling, Geroge L. (1982). Broken Windows: The Police and Neighborhood Safety, Atlantic Monthly Press, 249, 29-38. ZalNejad, K. (2010). Organizing Urban Furniture(Case Study of Noshahr City), Master’s thesis, Supervisor Dr. Syed Rahim Moshiri, Islamic Azad University, Rasht Branch.